Exhaust is the name given in dyeing to the leftover dye baths. So once you have dyed a batch of wool what you have left over in the vat is called first exhaust. Once you have dyed something in this you have the 2nd exhaust left. With this in mind I set out to dye pale pink! I needed quite a lot of dark crimson pink Cherry Coloured Twist sock weight yarn for the new pattern by Ysolda Teague being launched in the next issue of Twist Collective, so I started with a strong cochineal dye bath. As I need a lot of the dark pink I wanted my first exhaust to be as dark as the original dye bath. When one puts something in an indigo vat usually only 60% of the dye in the vat is used, so bearing this in mind I added another 40% of cochineal to the first exhaust to get back to the original strength. The second dye lot is darker than the first, therefore my 60% take-up estimate was wrong and a 1st exhaust cochineal dye bath is roughly about 50% the strength of the original dye vat. I suppose in theory that should go on as a normal mathematical progression. So dye lot 5 (if you haven't added any more dye stuff like I did) should be 1/16th the strength of the first. Nature doesn't seem to be like that, after a week of pink exhausts I was still getting stronger pinks than I wanted so, I took out a bucketful of the pink liquor and added twice as much fresh water and finally I got my pale pink! Which is the final one on the right of the image And what was left I added to a madder bath to give it that extra pink tinge! 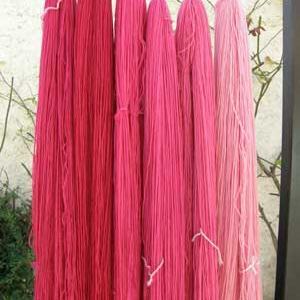 The pink sock yarns will be up on the web-site soon, some of them will be purple by then! If you want to learn more about cochineal and carry out your own exhausting red experiments visit Teresinha Roberts' site at Cochineal Dye.